What is Adjustable LAP-BAND Surgery? The LAP-BAND is designed to induce weight loss by restricting food consumption and is a variation of the Vertical Banded Gastroplasty (VBG). An adjustable elastic band is placed around the upper stomach to create a small 15cc (one half ounce) pouch with a narrowed outlet. The outlet size can be adjusted by injecting saline into a small reservoir (port) placed under the skin at the time of surgery and connected to the band by an IV tubing. The pouch fills quickly with solid food and empties slowly to relieve hunger and produce a feeling of fullness. Overeating results in pain or vomiting to limit food intake. No cutting or stapling of the stomach is required. The outlet size can be adjusted in the office by injecting saline into the band to loosen or tighten the opening. The band is more easily reversible with restoration of normal stomach anatomy after band removal. Erosion of the band into the stomach. Mechanical malfunction of the band. Does not limit intake of high calorie liquids or sweets. All of these disadvantages are known to occur in 10-22% of patients, and many require another operation to correct the condition. The LAP-BAND ® is not a permanent device and will require replacement or removal at some point in the future. The LAP-Band procedure can be accomplished laparoscopically as an outpatient with return to full activity in 7-10 days. Learn about your weight loss surgery options from the top rated physicians in the field. 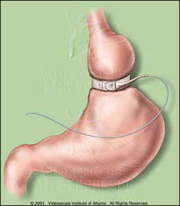 Options include Gastric Bypass, Lap Band, Realize Band, Gastric Sleeve, Vertical Banded Gastroplasty and Laparoscopic. What is Vertical Banded Gastroplasty? What is Roux-en-Y Gastric Bypass? What is a Gastric Sleeve Operation?